Swordfish are highly elusive, migratory and one of the most fierce predatory fishes in the ocean. It is also one of the largest fishes. They are also known as the broadbill. They can be easily recognized by their long flat bill that almost looks like a sword which is razor sharp and is used to slice their prey in half. Swordfish can swim at a speed of more than 50 miles per hour. The scientific name for swordfish is Xiphias Gladius. They belong to a category known as Billfish that also consists of sailfish and marlins. Young swordfish have scales but adult ones do not. Over the time, they lose their teeth and scales. An average individual can reach up to 3 meters in length. The biggest Swordfish was reported to be 4.55 meters in length. They are commonly found throughout tropical and temperate waters located in the Atlantic, Pacific and Indian Oceans. Females grow larger in size as compared to the male counterparts of the same age. Besides their long bill and large size, they have a large crescent shaped tail fin, a larger front dorsal fin, a smaller dorsal fin and pectoral fins. They have a tissue called “brain heater” that helps them to keep their brain and eyes warm in cold water. Swordfish have a few predators including sharks, Orca whales and humans. They actually slash at their prey rather than stab at them with their sword shaped bill. They are not social creatures ad prefer to swim alone rather than swimming in schools (groups). Declan, Tobin. " Fun Facts about Swordfish for Kids ." Easy Science for Kids, Apr 2019. Web. 25 Apr 2019. 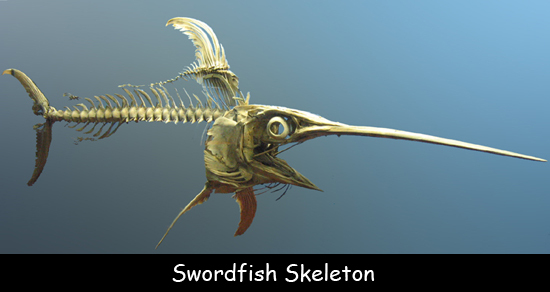 < https://easyscienceforkids.com/swordfish-facts/ >.